Three hooks on the bottom of this solid Pewter decorator design will surely stand out at your door. Hang your keys here for easy location the next morning. Also handy for belts, ties, pet items, jewelry, etc. 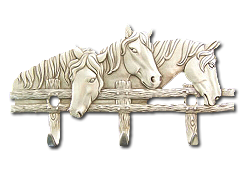 Decorative & detailed horse design. Pewter & craftsmanship capture intricate details. Adds a touch of class to any decor.